In the fall of 68 the 192nd was given 2 Korean pilots so that they could fly with us and observe our techniques. Each of the slick platoons got one and ours was named Cpt. Kim. After bouncing around for a few flights with other pilots it became my job to fly with Cpt. Kim. I found Cpt. Kim to be a very intelligent person but there were 2 problems that I had to deal with. The first was his English. He could speak English but I had to listen really close and anticipate what he was trying to say in order to understand him. As our time together wore on his English improved quite a bit. I learned quite a bit about Korea and his life there as well as the Korean outlook on the war. The second problem was a big one; he could not fly worth beans. The ability was there as well as an intense desire but it seemed as though he was self-taught. I don't know where he got his flight training but it was extremely poor and as a result most of our training was simple helicopter basics. Because he could not handle the ship very well it would jeopardize both the crew and ship to use him in combat so almost all our flights were Ash & Trash types. Fortunate for me Cpt. Kim had a sense of humor and understood the situation. On one particular flight we had to pick up some U.S. types at the end of the runway at the HQ pad and Cpt. Kim was having a little trouble hovering. We finally got there and he got it down but we had to wait a short while for our passengers. Because of the sun we had our dark visors down. Our passengers finally got on board and I let Cpt. Kim have the ship for takeoff while I talked to the tower. Because we were on the short end of the runway Cpt. Kim would need to pull in a little more power than usual in order to clear the small hooch's there. He did that just after passing through translational lift but forgot to kick in left pedal, to compensate for the additional power, which would keep us pointed in the right direction. Because no pedal was added the chopper torqued around and started flying sideways. This upset the CE a little because he was not used to being in front of everything, which was the pilot's job. The passengers as well were aware that this was not your normal takeoff. I was still on the controls and gave Cpt. Kim a few seconds to think about it then gave the left pedal a push, which straightened us out. I then looked over at Cpt. Kim and even with the visor down he knew what kind of look I had on my face, he said "Sorry". I knew what was happening but had to let him embarrass himself a little so it would sink in and he would learn by it. Though we were in no actual danger Cpt. Kim didn't know that but knew he had just screwed up. It did sink in and with the ship now pointed in the right direction we began the mission. The guy in charge of the mission picked Cpt. Kim to talk to about the mission. Normally we just yell or extend the helmet mike and hit the floor mike button for passenger conversation but Cpt. Kim promptly took off his helmet and gave it to the officer. When that officer saw Cpt. Kim's smiling face he about died. His lower jaw had dropped well below his Adam's apple and I knew he had figured he had gotten on the wrong ship and was probably going to die in a crash as a result. I think the takeoff had a little something to do with it. We were still flying into the sun and with my visor down he could not tell if I was Korean as well. When I finally spoke he told me he was sure happy to hear an American's voice coming from that seat. We both had a good laugh over that one. In the fall of 68 the rules of war changed, some think due to a trader high up in command. All the pilots were gathered together and informed that as of now we could not shoot back if shot at because the stray bullets might hit friendly troops in the area. If we were shot at we were supposed to call the local commander who then would call the district commander for that area who then would call the Vietnamese commander for that area and if there were no troops in the area we would be given the OK to return fire. Going through all that would probably take a day or two. They also told us our call sign was now changed from our respectable "Pole Cat" to "Filmore Signet", what a sorry call sign. That lasted a couple of weeks because it really screwed things up with all the outpost and pickups. We went back to "Pole Cat" on our own and nothing was ever said again about it. Cpt. Kim and I were given the mission to relocate a Vietnamese outpost on High Way 1 to a new location just 10 miles south also on High Way 1. 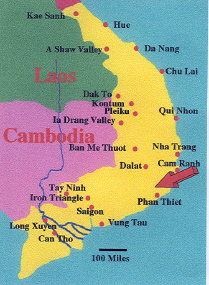 We were somewhat north of Phan Thiet but out of radio range because of a poor radio. The flights lasted only about 8 minutes or so and Cpt. Kim was having a ball doing all the flying. We had done about 10 or so flights when the outpost we were working for gave us a call. We were told that someone on a motorcycle had just stopped by and told them that a U.S. jeep had just been ambushed down the road and that 2 Americans and a Vietnamese lady had just been shot. They asked us to check it out. It just so happened that we were on the empty return trip when we got the call and only about 3 minutes away from the ambush. We spotted the jeep but didn't see any bodies because they had been picked up by someone just behind the jeep when they saw the VC hightail it into the large expanse of swail grass to the west of the highway. We found out later that the 2 Americans were AWOL GIs from Saigon that had stolen the jeep and were headed north with one of their girlfriends. We circled the jeep from about 500 ft and notified the outpost what we had found. Then low and behold I noticed lines in the swail grass. It seems that when one goes through the grass it results in the blades tilting slightly. You can't see it from the ground but from the air it looked as if someone had drawn a line to each of the 4 VC that were now trying to hide in the grass. We had them dead to rights but couldn't shoot. I got some altitude and tried to call back to base but couldn't get anyone. Just then 2 of the guys started to run for it. They had about 3/4 mile of swail grass to go through before hitting a train track that separated the grass area from the tree line. The lead guy had a white hat and all 4 had rifles. I ordered the CE to open fire with the fire directed just in front of the guy with the hat. I was hoping he would think we were just bad shots and lay down a while so we could gain some time and make some more calls. He figured it out and just kept running. We used up our machine gun ammo just as he made it to the tree line. Because we were getting low on fuel we had to return to Phan Thiet. About 15 minutes out of Phan Thiet I got a hold of someone else's gun ships and put them on to the location and outpost frequency. As we landed at the fuel pit, I had my 3rd tail rotor failure and had to set her down right there. Unbeknownst to me an oil can had bounced through one of the circular relief holes in the tailboom bulkhead area. It wedged vertically directly under the left pedal hydraulic servo, which resulted in a frozen pedal. I ordered everyone to get what they could and follow me. We then went to the closest ship on the line, found that it was flyable and promptly stole it. By the time we got back to the ambush the gun ships from the other company were already there and they were granted permission to fire from who knows where. I directed them to a "U" shaped patch of trees where the VC with the white hat had gone in and they blew it up. I doubt he was still there. We did follow out the other lines in the grass and found one of the VC hiding under a little trestle where the train tracks when over a small gully. Troops from the compound came out and picked him up. Cpt. Kim was cool during the entire thing. He later told me he would have shot them all when we first spotted them. I often wondered about how I would have felt if the old rules had still been in effect and I was able to order those 4 VC killed. I wondered also about the VC in the white hat and what he must have been thinking about, us catching him red handed and not finishing the job. We finished our resupply of the outpost and returned to base. Cpt. Kim had a little trouble figuring out why we were so limited by rules that were so obviously planted by the enemy. The OPS officer told me about the oil can and then told me not to steal any more of his ships. Except for getting in and out of the rather tight chopper revetments I let Cpt. Kim do virtually all the flying and his flying did improve quite a bit. I reported such to OPS and they let us pull out one of the ranger teams that were in the nearby jungle. I let Cpt. Kim spot the team then told him how to set up for the extraction and he took us in. I bet flight-lead watching from above was rather concerned about the extraction knowing it was Capt. Kim down there. On short final I took over with him also on the controls and we were in and out in about 2 seconds. It was about as perfect an extraction as one could hope for. We didn't even have time to put a skid down before all of them were in and the CE gave us the "Go" command. Coming out of there I saw two trees that had a gap between them that I could fit the chopper through. Going through that gap would give me an additional second or two of increased airspeed versed climb for the cyclic climb I would be doing once I hit max air speed so as to get out of shooting range. With the rotor just over the tops of those trees I went through that gap, which probably caught both the crew chief and his door gunner by surprise, the fit was tight but the room was there so I took it. Within seconds of clearing that gap we hit the elevator "UP" button and up we went at max climb. Cpt. Kim then got the ship back. As we were climbing out he commented on how professional we Americans were and at such a young age. I think he also said that he was glad he was working with us instead of against us. I look back now and his commet becomes even more important to me. I think he was initially somewhat dismayed at getting me, but a really young Warrant, as his training pilot, him being a Captain. Because I was staying with him longer than with the other pilots, he was getting comfortable with me but still saw me as just a bottom-of-the-line baby-sitter pilot experience wise. I feel that rather tight extraction surprised him since I was going to be the one going in and not a much more seasoned pilot specializing in such, which he expected. What I believe surprised him even more was that even I, just a mere kid, could do such an extraction like it was just another day on the job. He now realized that we all were like that and this mere kid of a pilot was indeed the "real" thing. I sometimes wonder how he made out flying wise when he returned to his own unit. Less than a year later I asked for and received a tour of duty in S. Korea. That is a story for another time.